Himanshu S. Amin practices in the area of intellectual property law, including patent, trademark, copyright, unfair competition, and trade secrets. Himanshu founded the firm, and built from scratch one of (if not the) largest electrical/computer science group of patent practitioners in the country. Numerous high-tech companies seek the services of the practice group at Amin, Turocy & Watson, LLP for its consistent delivery of high-quality work-product in the complex electrical and computer arts as well as the bandwidth to accomplish large projects in a relatively short amount of time without requiring use of numerous firms. Himanshu is retained frequently by executives and top researchers to conduct forward patenting sessions in connection with cutting-edge technologies. 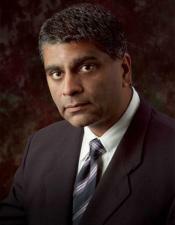 He has extensive experience with patent prosecution and patent portfolio development/analysis. He has assisted over twenty Fortune 500 high-tech clients with respective patent portfolio development and management efforts. Many clients routinely engage Himanshu to work with their most senior-level executives in connection with offensive and defensive forward patenting initiatives. A number of clients also utilize his expertise to develop and implement creative conflict resolution strategies, and perform due diligence analyses & valuation in connection with IP-centric corporate acquisitions as well as positioning companies for acquisition. He is an Adjunct Professor of Strategic Intellectual Property Management at Case Western Reserve University School of Law. Himanshu is listed in Super Lawyers magazine. He is an Executive Member of the Board of Trustees (and chairs the Marketing and Sales Committee) for Playhouse Square, Cleveland, OH, is on the Dean's Advisory Board at the Weatherhead School of Management, is a member of the Board of Trustees at Hawken School, and serves on the Editorial Board of CBC Magazine. Prior to practicing law, he worked for a number of years as a design engineer at a multinational engineering consulting firm. During law school, he was the recipient of the Nathan Burkan award for copyright law, placed second in the U.C. Berkeley Boalt Law School National High Technology Writing Competition, and authored "The Lack of Protection Afforded Software Under the Current Intellectual Property Laws," 43 Clev.St.L.Rev.1, 19 (1995). Himanshu received the Legals Finest Global 200 award, and top ranking for intellectual property law in the U.S. for 2015-2016. Adjunct Professor of Advanced Patent Preparation and Prosecution (PPP2) at Case Western Reserve University School of Law.